Skeleton Viewer is a tool that can load and display skeleton data. This can be useful for testing how skeleton data exported from Spine is rendered in an actual runtime. Skeleton Viewer uses the spine-libgdx runtime, which is the reference Spine runtime upon which the others are based. Even if you aren't using spine-libgdx, if you are having a problem with how any runtime is rendering a skeleton then the Skeleton Viewer can help to determine if the problem is in spine-libgdx, the runtime you are using, or in your code. The source code for Skeleton Viewer is available here. Choose the version that matches the version of the Spine editor you have exported your data from. If you need older versions of the Skeleton Viewer, you can browse the Git history and run it from source. Running from the command line has the benefit that you can see any error logs that may be output. The Browse button is used to open a JSON or binary data file that has been exported from Spine. 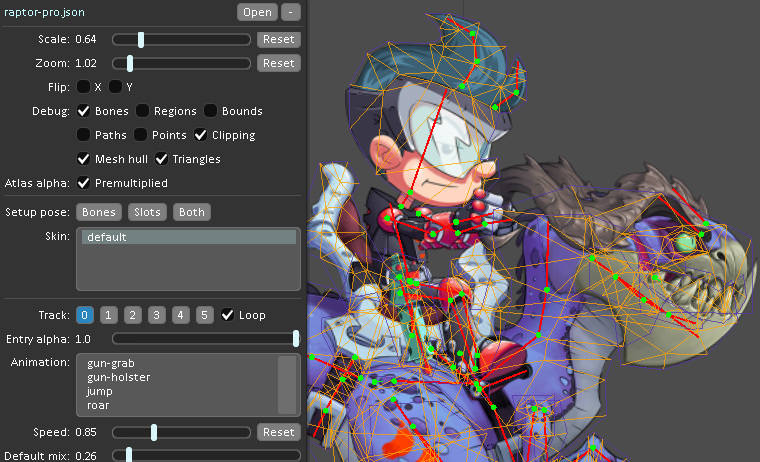 Both the trial and full version of Spine are accompanied with example exports that the Skeleton Viewer can open. These can be found in the Spine or Spine Trial installation directory. Skeleton Viewer looks for a texture atlas with the same name, next to the chosen data file. For example, if raptor.json is opened, it will look for raptor.atlas. If the atlas is not found, translucent white squares will be used instead of images. Skeleton Viewer monitors the data and atlas files and automatically reloads them if they are changed externally. The chosen skeleton is loaded and shown in the black area on the right. Click and drag in this area to move the skeleton. The Scale, Flip and Debug controls can be used to better visualize the different parts of the skeleton. If the images have a dark edge or otherwise don't appear correctly, try checking or unchecking Premultiplied. When checked, rendering expects the atlas to have been created using premultiplied alpha. The animation selected in the Animation list will be played. Selecting a different animation will use AnimationState to cross fade to the new animation. The Mix slider controls the cross fade duration in seconds. The Setup Pose buttons resets the bones, slots or both to the setup pose. This is the same as calling setBonesToSetupPose or setSlotsToSetupPose. When an animation makes changes to a skeleton, the changes persist until your code or another animation changes them. Since an animation only makes changes to the parts of a skeleton it has keys for, the result may be that an animation unintentionally affects another. See Animation changes for more.